Bloomers are like knickers or pantaloons, and were a popular later style underwear. Our stylish bloomers are below-knee length and have elastic waist and elastic around the knees. 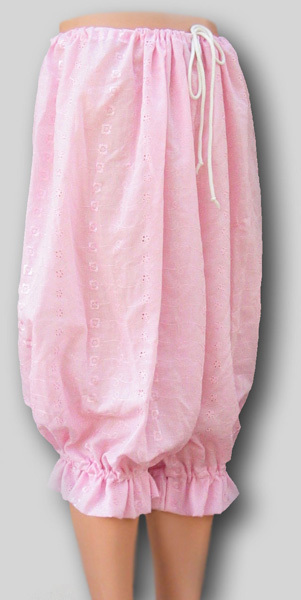 We make bloomers out of polycotton, muslin, blue or pink eyelet fabric. Wear with our short, short-sleeved chemise for a cute pair of pajamas! We also offer full length bloomers.